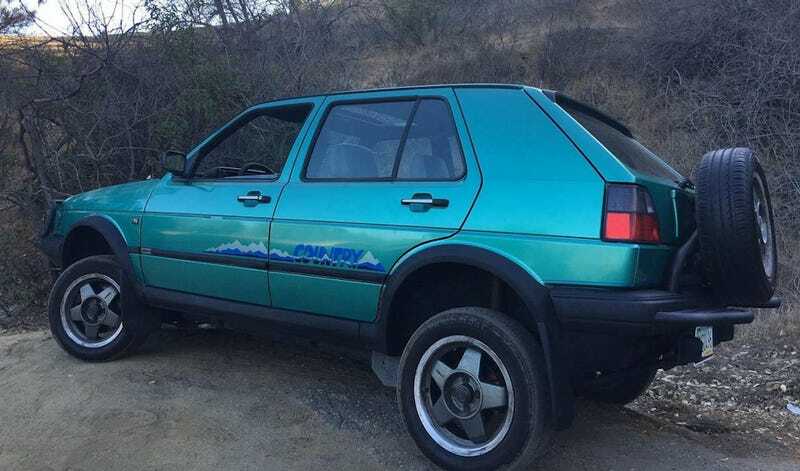 For $12,500, Would This 1990 VW Golf Country Syncro Jack You Up? The seller of today’s Nice Price or Crack Pipe Golf Country calls it SYNCRO SYNCRO in his ad title maybe because it’s AWD is twice as nice as FWD? Let’s find out if this rare gray market soft roader has a price that’s twice as nice too. Songwriter Randy Newman got in trouble once for writing a song called Short People, which was a sarcastic look at the asininity of prejudice. Unfortunately, a number of actual short people took offense at being the instrument through which Newman expressed his sarcastic pasquinade, and he is said to now rue ever having written the song owing to its misinterpretation. Yep, I’ll be humming that all day now. Speaking of music, how many of you like Country? You know, Achy Breaky Hair, How Can I Miss You if You Won’t Go Away, She Got The Ring And I Got The Finger, that kind of stuff? Okay, well even if you don’t like that kind of country, you may like this 1990 Volkswagen Golf Country Syncro. This high achieving Vee-Dub is said to be a 2016 import from Germany where these things live, and is now offered in, of all places, California with what the ad says is a new catalytic converter. Breathe deep that clean air. It’s also said to have been registered, however based on the license plate visible in one of the pics that registration took place in Arizona, not the Golden State. This is one of about 7,700 Jacked up Golfs (Jack Rabbits?) that VW built over the course of the ’90 to ’91 model years, and one of only a handful in the U.S..
None of those that did make it here were sanctioned by either Mother Volkswagen or the Feds. Owing to the commonality of engines emissions pieces between foreign and U.S. versions it shouldn’t be too taxing to even get this one BAR’d up in California. The car itself looks to be in decent shape, with the notable exception of a dent behind the bull bar on the driver’s side fender, and some rust ahead of the same-side rear arch. There appears to be fresh paint on those bull bars, as in some of the pics the turn signals are yet to be unmasked. The rest of the paint is claimed original. Out back, the rear step plates look a lot like the Bugatti Chiron’s U.S. bumpers so that’s a conversation starter at parties. The tacky Country decals still span the doors and over all the car exhibits the stance of a little dog trying to pee on long wet grass. Some people like that. Inside there’s some nice cloth upholstery and Recaro sport seats. Everything looks tidy and VERY ‘80s. A five speed stick matches to the 114-bhp 1.8-litre four, and there’s no A/C to eat up any of those ponies so wear deodorant when driving. All that stuff is said in the ad to be original, and the car comes with not four but eight OEM wheels, because SYNCRO, SYNCRO, SYNCRO, SYNCRO. Also because the ones on the car appear kind of eff’d up. If you happened to want to sync-up with this Golf, it would cost you $12,500. Now, that will buy you a three or four year old present-generation Golf, but not one with AWD. And probably not one with only 19,000 miles on the clock. What’s your take on this Country and that $12,500 price? Does that make you want to go out in the Country? Or, does that make this no Country for any men (or women)? H/T to Andrew David for the hookup! For $15,500, Could This 1982 Chevy Blazer Dually Be Your New Favorite Little Tow?